Kids aren't the best eaters, which I am sure is no surprise. Beyond bribing with treats, not much works to get little ones to eat the healthy stuff on their plate. Sometimes even bribes don't work! 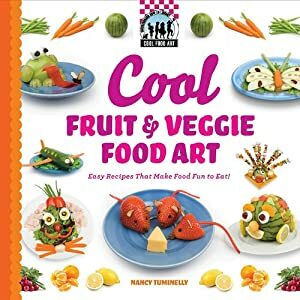 If you're at a loss at mealtime or are just looking for ways to make meals more fun, try making some food art. Now, you don't need to be a food stylist to make this happen. I just go with smiley faces most of the time. Your kids may also enjoy making their own creations. This strategy is particularly helpful for children that are very picky eaters or have feeding challenges. I once sat in awe and watched a speech pathologist work on getting children to explore different food textures by putting marshmallow fluff on the end of a pretzel rod and asking kids to go "fishing" by putting the sticky pretzel on some goldfish crackers. Sounds disgusting, but those "picky" eaters ate up those fluff covered goldfish like it was manna from heaven. Let your imaginations run wild! I'd love to see some pictures, if you get creative.